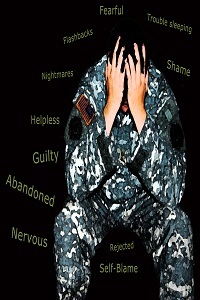 By definition, PTSD always follows a traumatic event which causes intense fear and/or helplessness in an individual. Typically the symptoms develop shortly after the event, but may take years. The duration for symptoms is at least one month for this diagnosis. Symptoms include re-experiencing the trauma through nightmares, obsessive thoughts, and flashbacks (feeling as if you are actually in the traumatic situation again). There is an avoidance component as well, where the individual avoids situations, people, and/or objects which remind him or her about the traumatic event (e.g., a person experiencing PTSD after a serious car accident might avoid driving or being a passenger in a car). Finally, there is increased anxiety in general, possibly with a heightened startle response (e.g., very jumpy, startle easy by noises). Psychological treatment is considered the most effective means to recovery from PTSD, although some medications (such as antianxiety meds) can help alleviate some symptoms during the treatment process. Prognosis ranges from moderate to very good. Those with the best prognosis include situations where the traumatic event was acute or occurred only one time (e.g., car accident) rather than chronic, or on-going trauma (e.g., ongoing sexual abuse, war).